Posted April 21, 2008 by Sage & filed under Media, Training and Racing. 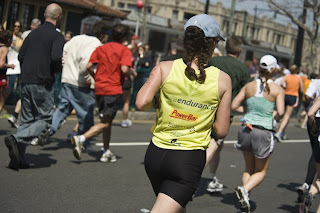 Long, long story short: it was a good day for me at the Boston Marathon. I came in under my goal of 3:45, finishing in 3:43:30. (I decided trying to PR would be too tough, and I’m glad, because this was certainly as hard as I could have run today.) Thus I’ve requalified to run it in 2009, though I thought through most of the race, “This is it, do it now.” Be in the present! I was so focused, I ran right past my mother and never registered her yelling for me. She got a few shots of me as I passed; here’s one where I may be overrotating!